Cobra™ AN Fittings, Adapters, Brackets, Hdwe, etc. Our Products >> Cobra™ Performance Fuel & Oil Hoses, Fittings >> Cobra™ AN Fittings, Adapters, Brackets, Hdwe, etc. Need a cool way to separate your Cobra™ Oil Hoses and keep them secure together? This handy little clamp bracket does just that. Comes with allen screw to keep clamp halves together. Here's a neat way to secure your Cobra ™ full-flow oil lines using your exhaust manifold studs on #4 cylinder. 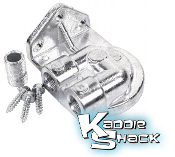 This bracket bolts directly up to the existing head studs and keeps your oil lines secure and away from your header. This adapter mount is used to mount an external oil filter on your vehicle when a full-flow oiling system is used. We recommend using the 51515R Wix filter, which will hold up to the extreme pressure that can be generated in the oiling systems, particularly at start ups on cold days. This adapter mount is used to mount an external oil filter on your vehicle when a full-flow oiling system is used. We recommend using the 51515R Wix filter, which will hold up to the extreme pressure that can be generated in the oiling systems, particularly at start ups on cold days. 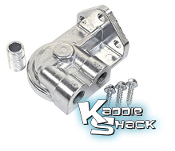 This Cobra™ clamp is used to secure a #6 fuel hose to a fan shroud, firewall, etc. It comes with a flush mount screw and locking nut, but can be drilled out to fit a stock engine tin screw, etc. It's a super nice way to keep your fuel hoses from dancing around in the engine bay. This tool is great for holding your Cobra™ fittings while tightening them during assembly. 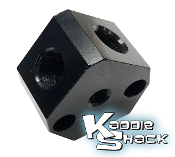 It is made of rigid black plastic, so it won't scratch up your fittings, and it has two powerful magents in each side that stick to your vise before you clamp the fitting in. 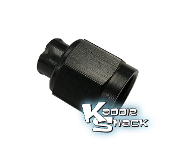 This Cobra™ adapter is commonly used to connect the #4 AN swivel flare to any 3/8" MPT (male pipe thread) connection such as on a fuel pressure regulator, fuel injection inlets, etc. Use thread sealant on the pipe thread fittings only. Never use any on the flared side. Ever need a flared cap to test a connection or plug off a hose fitting while you're working on a component? Here's a female swivel cap that will fit on the standard #6 (3/8") male flared fitting. 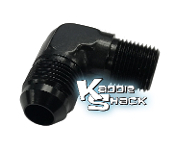 This Cobra™ adapter fitting is used to reduce a 1/2" pipe fitting to 3/8". It is 1/2" MPT (male pipe thread) on one side, and 3/8" FPT (female pipe thread) on the other.